Posted byadmin	 31. 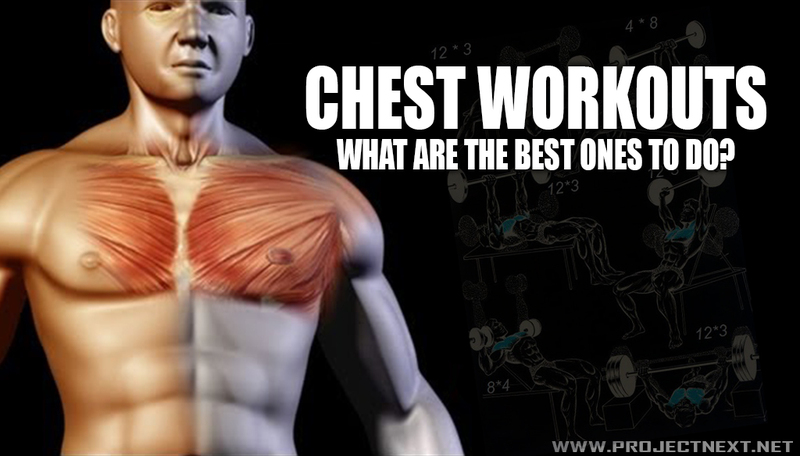 January 2015 Leave a comment on Chest Workouts! What Are the Best Ones to Do? There are a few particular chest workouts that are really going to be great for you but you just don’t yet know which ones they are. There are also some terrific chest workouts which you can try and that you can do if you are a female, however, most women don’t tend to want an overly muscular and worked out chest. It is generally more for the men, who want to work out their pectoral muscles and who want to benefit from really good chest workout ideas. 1. Hold the pulleys in each hand, after setting the resistance for the pulleys and positioning the pulleys above your head. 2. Step forward of an imaginary line between the two pulleys while having a slight lean forward in your posture from the waist up and pulling your two arms together in front of you. This is the starting position. 3. Slowly let your arms travel back in an arc until you feel a slight stretch in your chest, maintain a slight bend in the elbow to stop bicep stress and breathe in as you perform this movement. Note your shoulders should be moving but your body and arms should remain in the same positions. 4. Using the same arc motion return your arms to the starting position. Remembering to breathe out at the same time and to keep your body and arms in the same positions while moving the shoulders. 5. Continue until the desired reps are reached. 1. Set-up by sitting down on the bench supporting the two dumbbells on your thighs, then once settled on the bench lift your dumbbells up to shoulder width apart in front of your chest. Finally twist your hands so your palms face away from you as if you are holding a bar between the two. 2. Keeping control of your dumbbells constantly push them up with your chest as you breathe out. 3. Once you reach the top hold and then lower your dumbbells back down to your chest. 4. Repeat the movement for the required repetitions. 1. Lie flat on the floor and place your hands just above shoulder width apart, and holding yourself on them with straight arms. 2. Lower yourself down while inhaling until your chest almost touches the floor. 3. Hold and then return to the top while exhaling. 4. Repeat for the required repetitions. These three exercises will be a great start to your chest workouts. A little bonus advice an exercise rhythm that works great for me and others who I have researched is to do the following. The motion you breathe out on, i.e. the strenuous part, should take 1 second, then you hold at the top for 1 second, then the motion you breathe in on, i.e. the relaxation part, should take 2 seconds. This should help you to get the max out of your reps and you will certainly feel it.